Ever wanted to be Indiana Jones looking for treasure among relics? Here is your chance to go antique shopping in various markets throughout the city. This tour gives you your very own antique market guide to take you around various antique markets. 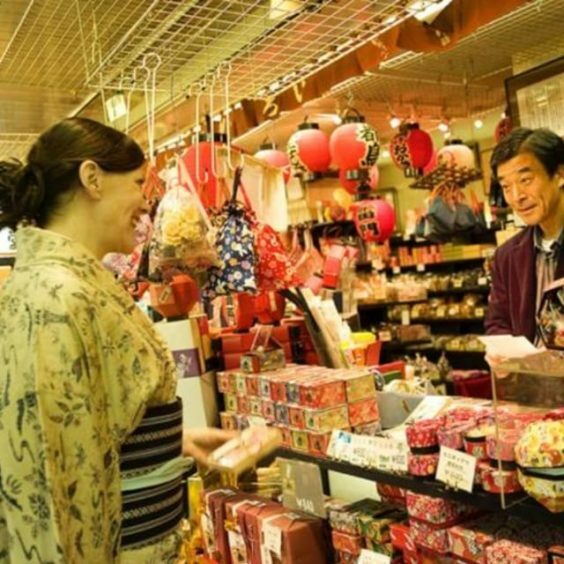 These markets, usually at shrines, have a huge variety of everything beautiful and antique, from kimono to pottery to samurai swords to geisha pillows, often at rock bottom prices because there is no need for these items in modern life. There are many antique and flea markets run throughout the city, mostly on Sunday mornings. Many are at famous shrines, and the shrines are often sight seeing places in their own right. Sometimes if you are lucky, you will see a bride all dressed up for her wedding photos, or children coming to the shrine for coming of age ceremonies or such, depending on the time of year. This tour will be run by Sayuki from time to time, and by request, but will often be run by Sayuki’s trainees. This is a way to let the little prospective geisha in Sayuki’s house practice their English skills and get some income during the crucial first year when they are training to become geisha. Do help us help the little geisha to continue the beautiful geisha tradition in Japan.